Giant Wetas can grow over 50mm long and weigh as much much as 25 grams. Although fearsome looking they a actually with dough seal and there diet is largely vegetarian. It leads a solitary not eternal life spending the day in habitation or under day. They mainly Survive on off shore Islands where it is safe from introducded Predators. 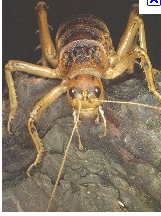 Ground weta is the smallest of all wetas and hides in burrows in the ground during the day concealing the exit of their hole. They hunt at night for predators and eat invertebrates and fruit. They do not have Ears on their knees like other wetas They also do not have spiky back legs like other wetas. To attract mates, they drum on their abdomens.